SERCO Inc. in Borger, Texas embodies pride as a reputable industrial general contractor serving the Southwest for over 30 years offering a full spectrum of industrial services to our clients from general construction and maintenance to fabrication and engineering services. Each industrial project is unique and requires a solid understanding of the business as well as client perspective. We possess the quality, versatility, and integrity to solve client’s toughest challenges resulting in the delivery of effective project outcomes that are sure to exceed expectations. industrial general contractor who has the experience and expertise to do the kind of work you need. Our team has the background, resources, and safety performance for successful project execution each and every time. SERCO Inc. provides each of its clients the highest quality and most reliable industrial service required to get the job done. The heartbeat of SERCO Inc. of course is providing real business value services to our client demographic. Through this proven process of fairness and responsive decision-making, we have created ongoing relationships with many clients. Every client has goals that include: deadlines, budgets, and quality results, therefore your initial investment with Serco will offer you a solid savings all around. Though SERCO Inc. has many layers of success, it is our commitment and collective passion for quality assurance that sets us apart in meeting the intense demand of this industry. Plant shutdowns are both a necessary and a stressful time for any manufacturing plant. Each day that the plant is not producing products is costing the company lost revenue. Even so, without the improvements to the production line that are accomplished during the plant shutdown, the plant probably cannot continue being as profitable. Balancing the need for a plant shutdown for improvement with the need to keep the line running for profitability is one of the most difficult balancing acts in manufacturing. While plant shutdowns are often necessary to perform critical maintenance and improvements, proper planning, coordination and execution are essential. Proper management of the plant shutdown will ensure that all necessary work is accomplished, while preventing any unnecessary loss in company revenue due to problems and delays. A successful plant shutdown requires the coordinated effort of a wide variety of support departments as well as a number of vendors and contractors. SERCO Inc. understands your company’s needs for a successful plant shutdown... Read More..
Natural gas is among the most important fuels in the world. It powers vehicles, provides heat and power to homes and businesses, and it is a clean fuel that is the cornerstone of America's energy security. While the United States has ample supplies of natural gas, it is necessary to move the natural gas over long distances... Read More.. While backhoes and trenchers have their place in excavation, there are situations where these tools can do more harm than good. Considerable problems arise if an underground power line, water line, or fiber optic wire is struck. Because of this, a less destructive option has been developed that minimizes the risks involved when digging into the soil. This technique is known as Hydro Excavation and uses water to safely accomplish the job... Read More..
Welding Methods Are Evolving: Welding joins metals through a process called coalescence, achieved through heat and pressure. Heat sources like a gas flame, a laser, and electric arc, even an electron beam, can be used. As technology and metallurgy have evolved, so has diversity of the welding process... Read More..
General industrial construction projects are in a different class from their smaller counterparts. 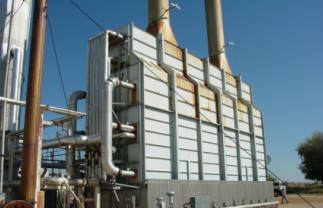 Industrial construction projects can range from power plants to compressor stations to industrial facility expansions. These kind of projects require an experienced general construction company with the equipment and personnel to handle it. With over 30 years of experience, SERCO Inc. handles both new industrial construction projects and expansion/renovation projects on existing facilities.... Read More..